If you are considering filing bankruptcy and live in Clay County, you will be required to file your case in the Federal Bankruptcy Court in Jacksonville. For this reason, consider using my legal services located downtown in Jacksonville, Florida. If I live here, why use a Jacksonville bankruptcy attorney instead of a Clay County bankruptcy attorney? I am a life-long resident of Jacksonville, Florida and practice bankruptcy law exclusively. I am a graduate of the University of Florida School of Law and served four years in the U.S. Marine Corps as a Judge Advocate General. I have over 25 years of experience handling thousands of bankruptcy cases in Jacksonville, Florida. My staff and I are familiar with the Jacksonville Bankruptcy Court Judges, Trustees and courthouse personnel. I have the knowledge and experience to analyze your problem and recommend the best course of action for you. I will personally prepare your papers so I know that you are getting the maximum benefit of the bankruptcy laws. Your free initial consultation can be by phone to save you time and money, or in my office – it will always be with me. 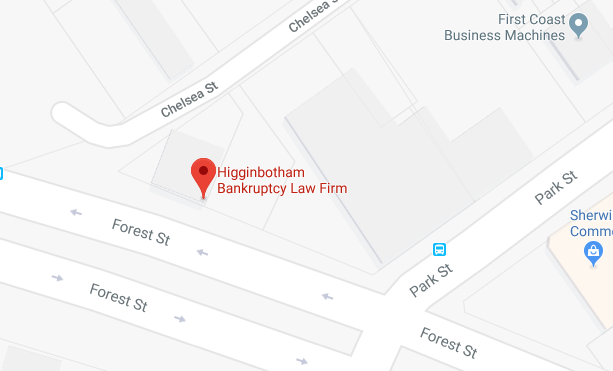 Call me – Doug Higginbotham today at 904-354-6604 or contact me by e-mail at Higginbotham Bankruptcy Law Firm to set up your free consultation. The hiring of an attorney is an important decision that should not be based solely on advertisements. Before you decide, ask us to send you free written information about our qualifications and experience. The information on this website is for general information purposes only. This information on this website is not intended to create, and receipt or viewing of this information does not constitute, an attorney client relationship.If you are in one of these counties we can help you. The Jacksonville Division is comprised of the following counties: Baker County, Bradford County, Clay County, Citrus County, Columbia County, Flagler County, Hamilton County, Nassau County, Putman County, St. Johns County, Suwannee County, Union County, Marion County, Sumter County and Volusia County.